KEITH WATSON has had no contact from Hibs regarding the possibility of extending his stay at Easter Road, the Evening News has learned. The versatile 25-year-old defender joined Alan Stubbs’ side on loan from Dundee United for the second half of last season in a move that was widely viewed as a coup. Watson was recruited in late January, predominantly to provide cover and competition for right-back David Gray, who at that point was recovering from groin surgery. The Livingston-born player started eight of the nine games for which he was fit and eligible, with Hibs conceding only two goals in his first six matches – a run in which they took 16 points from a possible 18. However, his last outing proved to be a 1-0 defeat at home to Queen of the South on April 4 after a hamstring injury sustained on the training pitch the day before a trip to Dumbarton effectively ended his season. 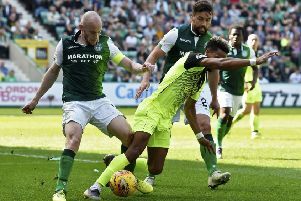 Watson had hoped to be fit enough to return for the play-off matches against Rangers, but aggravated his injury during Hibs’ warm-weather trip to La Manga last month. Despite his lack of action in the closing weeks of his loan stint, Watson was hopeful of landing a permanent contract at Hibs. His deal at United officially expired at the end of the season, but the Tannadice academy product already knew when he went out on loan that his time there was coming to an end. After 11 years with United, Watson is currently in limbo for the first time in his professional career. With no indication from Hibs so far that they wish to hand him a contract, he is open-minded about where his next move will take him. Hibs currently have four first-team defenders on their books in the shape of David Gray, Jordon Forster, Paul Hanlon and Lewis Stevenson, while they are keen to tie down Liam Fontaine on a new deal.